March | 2015 | WorstPlans.com updates every Monday! After washing bedsheets, it is difficult to immediately determine the proper orientation for a non-patterned fitted sheet (the bottommost sheet, with the elastic border, the one that looks like this). Frequently, one turns the sheet 90°, only to discover that the sheet was actually correct the first way. Shameful! Now that we have solved the issues of bubonic plague, dinosaur attacks, and coastal piracy, we must turn our efforts to solving the “fitted sheet orientation” problem. If a set of sheets have an obvious pattern on them (e.g., stripes), it can be easy to remember the proper orientation of the sheet. Fig 1: An obvious pattern (here, stripes) makes proper sheet orientation clear. This weird striped blob is supposed to be a fitted sheet. Fig 2: The mattress has a long edge and a short edge, unless you have some weird square- or circle-shaped bed, in which case you probably have problems finding sheets in the first place. Fig 3: Unfortunately, with solid color sheets, the only obvious orientation-determining feature is the location of the washing instructions tag. If you remember exactly where the tag is (e.g. “it goes on the left side”), then you have solved the fitted sheet orientation problem. Unfortunately, this tag is located in different places in different sheets. One simple solution would be to establish a regulatory organization (ideally at an international level) to standardize the location of the tag on fitted sheets. We could call this the “Fitted Sheet Tag Administration.” The advantage of just standardizing the tag location is that no manufacturing process would need to be changed, and no additional costs would need to be incurred in sheet design and/or production, since the tag is already present on all sheets. Fig 4: Tag location could be standardized. “The tag always goes nearest the starboard-side pillow.” Assumes that the bed is a boat, for sake of standardization. If a consumer could purchase a set of FSTA-licensed fitted sheets and know that the tag always belonged on (say) the right side of the headboard, then that individual would be able to put the sheet on the bed without experiencing any psychological trauma due to having to rotate the sheet. Fig 5: Standardized tag location allows the sheet to be rotated to the proper orientation without requiring guesswork. This is more total time than has passed since all of recorded history! PROS: Saves 10,647 man-years of work for every year. Generates new bureaucratic employment positions. CONS: The Fitted Sheet Tag Administration may become corrupt and decadent if it faces no accountability. Your lack of art appreciation has brought shame to the land. Redeem yourself with this one weird sponsorship trick. The fine arts constantly struggle for funding, perhaps due to their general inability to compete with modern sources of entertainment. In art museums, commercial sponsorship could take the form of (non-destructive) modification to the works of art themselves. For example, the Mona Lisa could be holding an iPhone (an idea which has been done before: https://www.google.com/search?tbm=isch&q=mona+lisa+iphone), or one could spot a Radio Shack in the nightmarish hellscape of Hieronymus Bosch’s Hell (http://upload.wikimedia.org/wikipedia/commons/f/f6/Mad_meg.jpg). Fig 1: A clear overlay (perhaps a piece of glass, or an animation cel) would be slid over the piece of artwork in question. 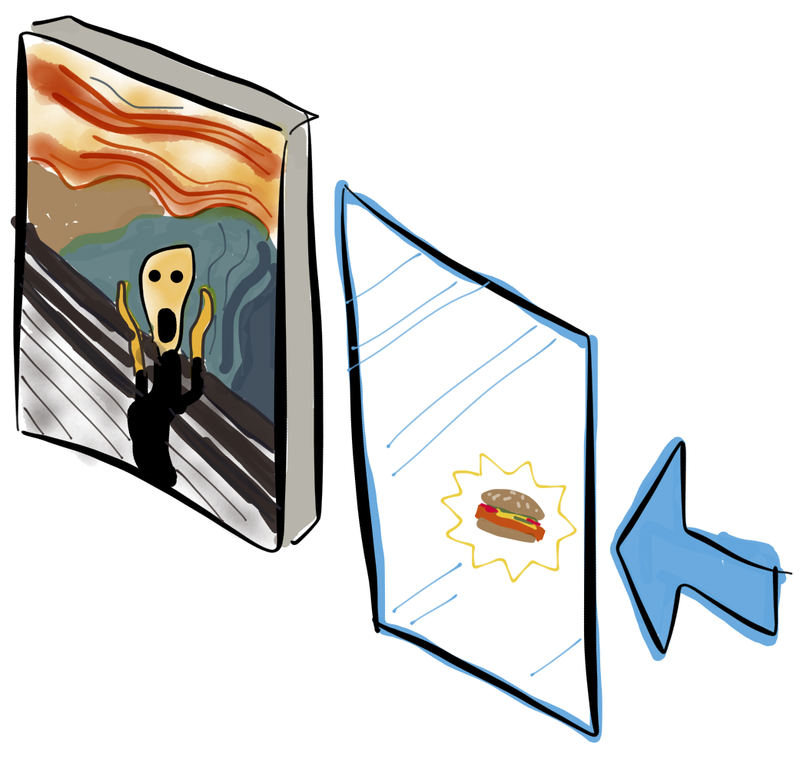 In this example, “The Scream” is modified to be chomping on a delicious hamburger. Perhaps this particular overlay would be a McDonalds ad, which might encourage Burger King to buy a competing overlay for another famous painting at the same museum. 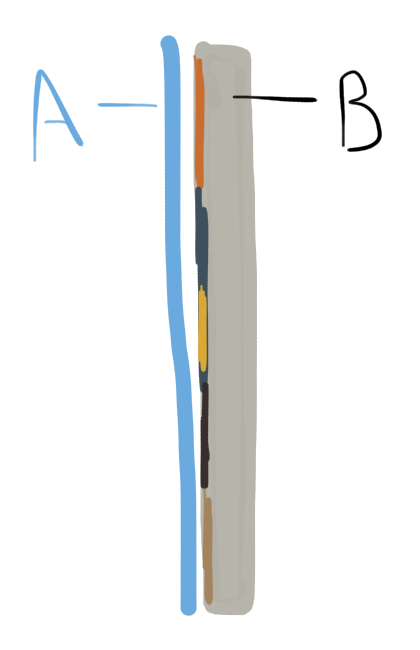 Fig 2: Side view of the above image: A is the clear overlay, B is the painting. One weird secret that sphinxes don’t want YOU to know!!! Theseus hates this riddle! This is a great idea and you (assuming you are a museum director or curator) should apply it right away! PROS: Saves fine art from destruction, brings more visitors to art museums. CONS: Could make regular non-sponsored museums seem boring in comparison.